Our Staff’s Favorite Summer Gear! Brian’s Picks. 1. 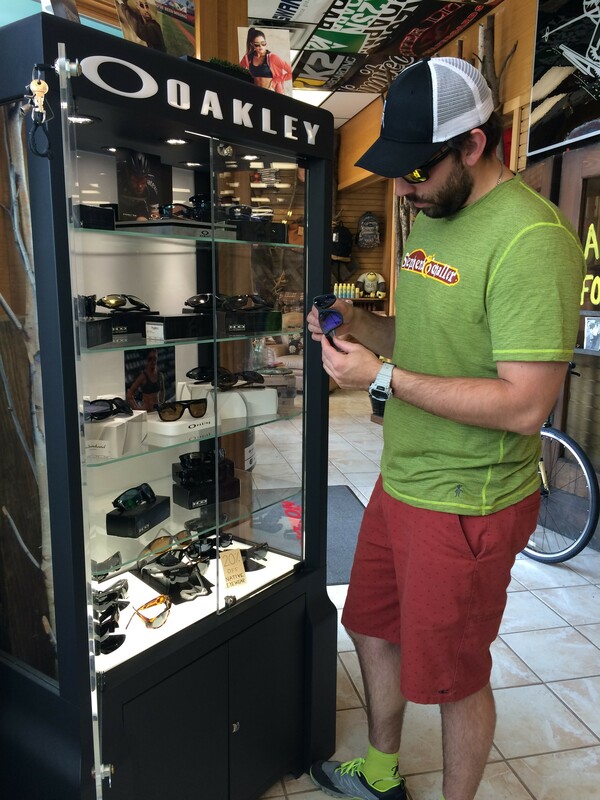 Oakley Sunglasses – Oakley has always been one of the most innovative companies when it comes to eye wear. I’ve been wearing Oakleys for years and still own my very first pair I bought for baseball. They offer awesome, comfortable lifestyle sunglasses as well as amazing, unique sport sunglasses. Oakley’s new technology, their Prizm Lenses, enhance colors and better your vision, boosting performance for specific sports. I have a pair for mountain biking that I wear for fun rides as well as races, and I’m telling you: they work. I see everything on the trail faster and more clear than I could with the naked eye. For road biking, I have a pair of the new Jawbreaker frames and they are the most comfortable sunglasses I have ever worn, plus they breathe extremely well and vent amazingly. Way to go, Oakley. I love you. 2. HO TX Slalom Skis – HO’s slalom skis are better than ever. They’re everything you would want for a fun day on the water… and more. They’re super stable and easy to ski, making waterskiing more inviting to people who may have been turned away form the sport before, and even more fun for the experts. HO has done their part and made a ski for everyone. They are awesome. 3. 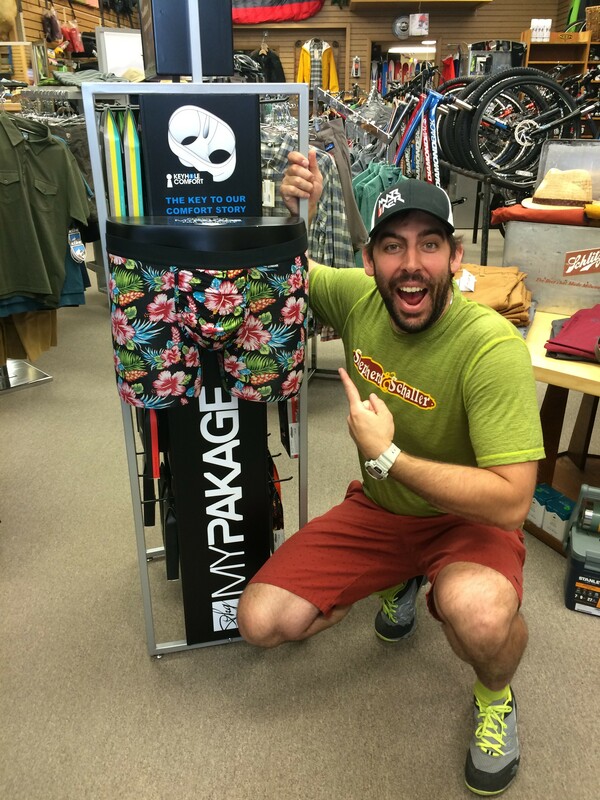 Mypakage Weekday Boxer Briefs – What is there to say…. they are the most comfortable underwear on the planet “for men”. They help me feel protected and safe all day long when I have them on. They make the worst days the best days. I feel like I’m on cloud nine when I am wearing them. They helped me find my dog when it was lost. They always keep me snug and happy. Mypakage is the best out there. You should try some for yourself. All of this and MORE can be found at Shep’s. Don’t forget Father’s Day is coming up… we just gave you three super good ideas for dad. 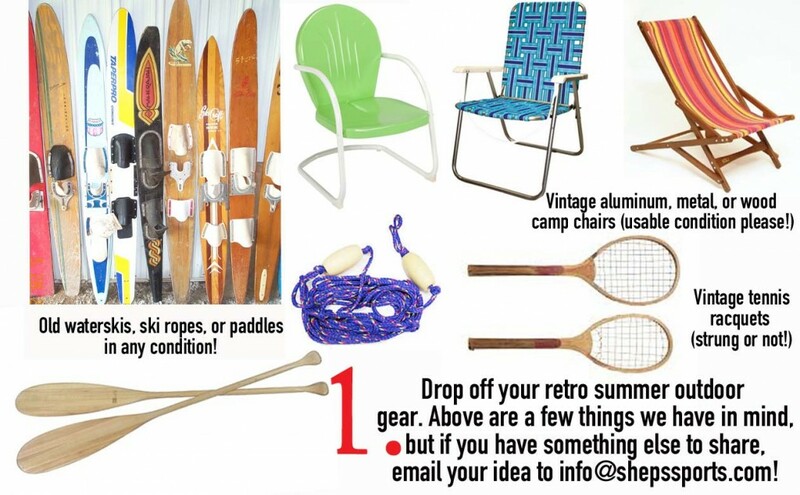 Author RachelPosted on June 11, 2015 Categories Apparel, Gift Giving Ideas, Lifestyle, Store Events, Uncategorized, Water SportsTags apparel, Oakley, staff picks, summer, waterskiLeave a comment on Our Staff’s Favorite Summer Gear! Brian’s Picks. We hope you’ve been taking advantage of our ski demos in the winter, because it’s your chance to test out the latest and greatest performance skis before making the purchase. And now? Now you can do it in summer too! Our waterski and wakeboard demos are in & ready. It’s the perfect chance to test new gear for your outing on Wisconsin lakes Wausau, Dubay, Minocqua, Monona, Mendota, Winnebago or wherever you love the water. For just $25 per day, you can ride the new goods. And if you make a purchase yet this summer, half of the money you spent on demos will be put toward your bill. Yes, we mean it!! 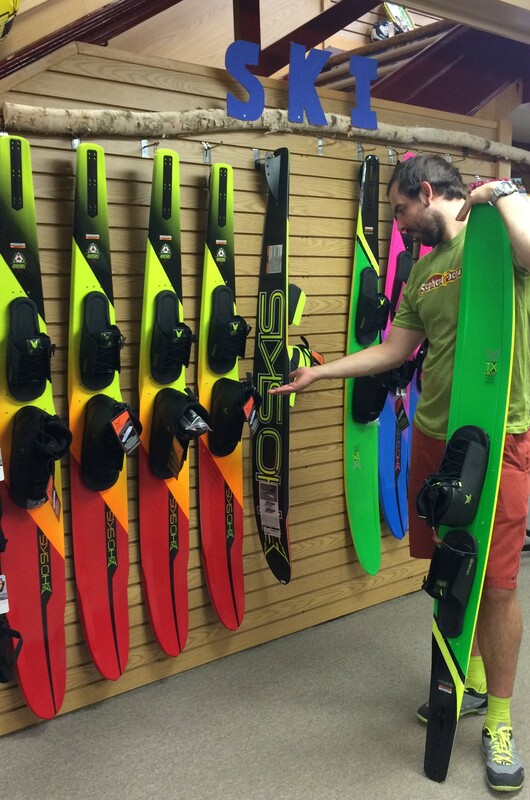 Use your “refund” when you purchase your new skis or board, PFDs, ropes or even Sun Bum Sunscreen. You need them all for fun behind the boat. All you have to do is decide before Labor Day. What are you waiting for? Grab some demo gear and get in the boat! Visit us in the store for details. As usual, you must be 18+ to demo, or have your parent/guardian with you. The weekend is almost upon us: when tents cover the parking lots, when racks line the sidewalks, and deals are all around. We’ve been doing sidewalk sales for nearly 65 years & we hope you’ll join us again this year to score some of the biggest deals of the year. Prices are never lower! We’ll have a tent, a sidewalk, and a store FULL of deals. 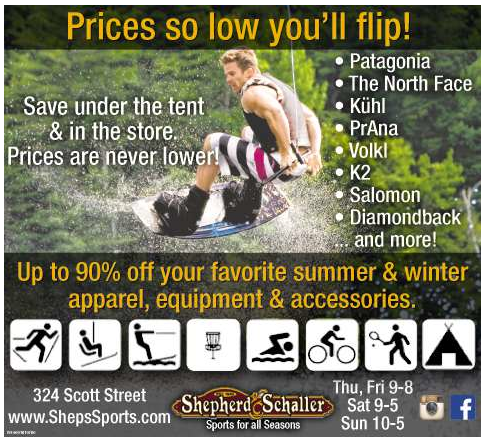 We’re talking up to 90% off summer & winter apparel, (absolute minimum of 50% off ski & snowboard outerwear! ), 30-50% off new summer clothing & footwear, 40% off snowboard equipment and 50% off alpine ski equipment, killer deals on bikes, tubes, waterskis & wakeboards, camp supplies & accessories, and more. Join us for Wausau’s Big Weekend! Just a couple of days away! Become Part of Shep’s Summer Experience! Our shop is all about outdoor memories. They’re why we do what we do. They’re why we’ve worked for 65+ years. It’s not just about the skis, the kayak, or the bike. It’s about the fun; the memories, the speed or the calm, the record breaking time, or the laughs with family. We hope you’ll join us as we think back on our favorite outdoor memories, as we dig up the hilarious old photos & bring our old, worn out gear to the shop, all to be put on display. We want our store to be an experience for you, and it can only be more complete if you get involved with us. Join us in one (or all!) of these three ways and leave your mark in our store this summer. Author RachelPosted on March 11, 2014 March 27, 2014 Categories Bikes & Biking in Central WI, Camping & Outdoor, Community, Paddle Sports, Store Events, Water SportsTags Bike, Camping, kayaks, Wakeboard, waterskiLeave a comment on Become Part of Shep’s Summer Experience!